Now CLIA Waived! K Number in CLIA Database is K071489. The donor fills the cup with urine, screws the cap on and gives cup to the person administrating the test. The cup includes a temperature strip, displaying the temperature of the urine sample enabling the tester to determine if the donor diluted the urine with water. One colored line is visible in the control (C) zone for that drug. 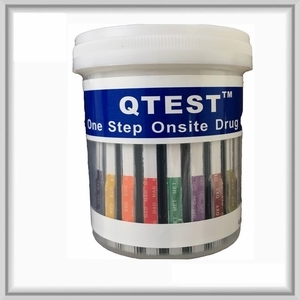 No colored line whatsoever appears in the test (T) zone, indicating a presumptive positive result for the corresponding drug. On-site rapid test results are in most states NOT used as evidence. However, the quick screen result determines if a lab analysis is needed. Usually, presumptive positive specimens are sent for lab analysis and a positive drug use is determined by the lab analysis result. Colored lines are visible in both the control (C) and test (T) zones, indicating that concentration of the drug is below the detection limit of the test or not present. The test lines (T) may have varying intensity, either weaker or stronger in color than that of the control line (C). However, any indication of a line in the test region should be interpreted as a negative result. If there are no lines visible, then the test is invalid. In this instance, re-testing of the specimen is recommended. A false positive can only occur as a result of the donor’s health and/or the impact of the medications the donor has taken. To prevent such problems, the tester must determine the donor’s health condition and medications taken during the pre-test interview.